Where It's Found in Utah: Many localities throughout the Colorado Plateau region of central, eastern, and southern Utah, including Cleveland-Lloyd Dinosaur Quarry, Emery County, and Dinosaur National Monument, Uintah County. Description: Measuring 25-35 feet (7-10 meters) long, Allosaurus was the most common carnivorous dinosaur in Morrison Formation ecosystems. The snout of Allosaurus was narrower than the back part of the skull, which was stoutly built for predation. The back part of the skull was also dropped down relative to the snout, allowing Allosaurus to have more teeth in contact with its prey when it snapped its jaws shut. Allosaurus had short crest-like horns in front of its eyes, which were possibly used to attract mates or recognize other members of its species. Although probably not a fast runner, we know from proportions of its hind limbs and reconstructions of the muscles that moved these limbs that Allosaurus was likely faster than other contemporaneous meat eaters and certainly faster than anything it preyed upon. 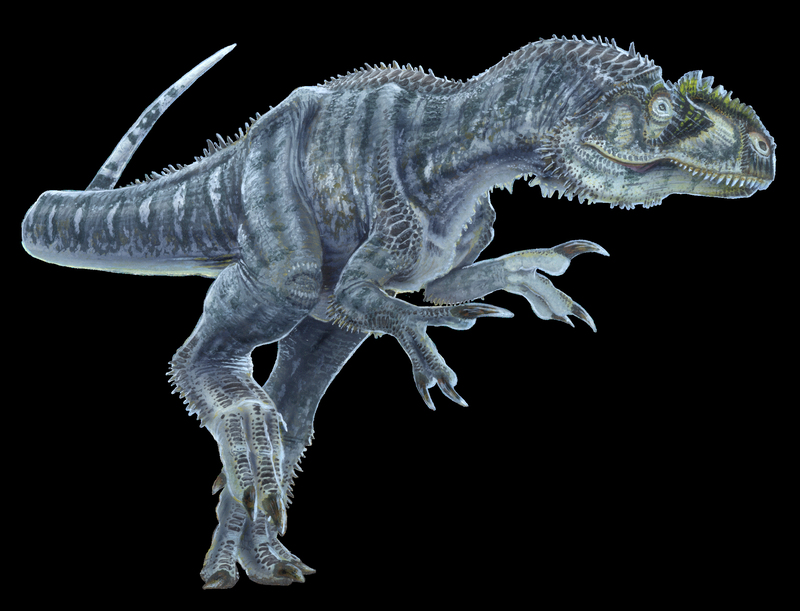 Unlike predators such as Ceratosaurus and Torvosaurus who lived alongside it, Allosaurus had powerful arms with large hands and big claws. These adaptations would have allowed it to use its arms in attacking prey. Why It’s a Top NHMU Dinosaur: Allosaurus fragilis is the quintessential Jurassic carnivorous dinosaur and one of the most popular dinosaurs worldwide. Not to mention, Allosaurus fragilis is the state fossil of Utah! Quarries in Utah, such as at Dinosaur National Monument near Vernal and the Cleveland-Lloyd Dinosaur Quarry near Price, have produced numerous exquisite specimens of Allosaurus and greatly expanded our knowledge of this Late Jurassic predator. The Natural History Museum of Utah has the best collection of Allosaurus anywhere in the world, including a range of individuals from babies only three feet (one meter) long to large adults over 35 feet (10 meters) long, allowing paleontologists to study how Allosaurus changed as it grew up. Where Can I See It? : The Past Worlds Gallery at the Natural History Museum of Utah; Cleveland-Lloyd Dinosaur Quarry; Dinosaur National Monument; Brigham Young University Museum of Paleontology; USU Eastern Prehistoric Museum; Thanksgiving Point Museum of Ancient Life. Madsen, J. H., Jr. 1976. Allosaurus fragilis: a revised osteology. Utah Geological Survey Bulletin 109:1-163. Foster, J. 2007. Jurassic West: The Dinosaurs of the Morrison Formation and their World. Indiana University Press, Bloomington, 389 pp.